Posted on Wednesday, January 30th, 2013 at 11:14 am by Ty Anderson. 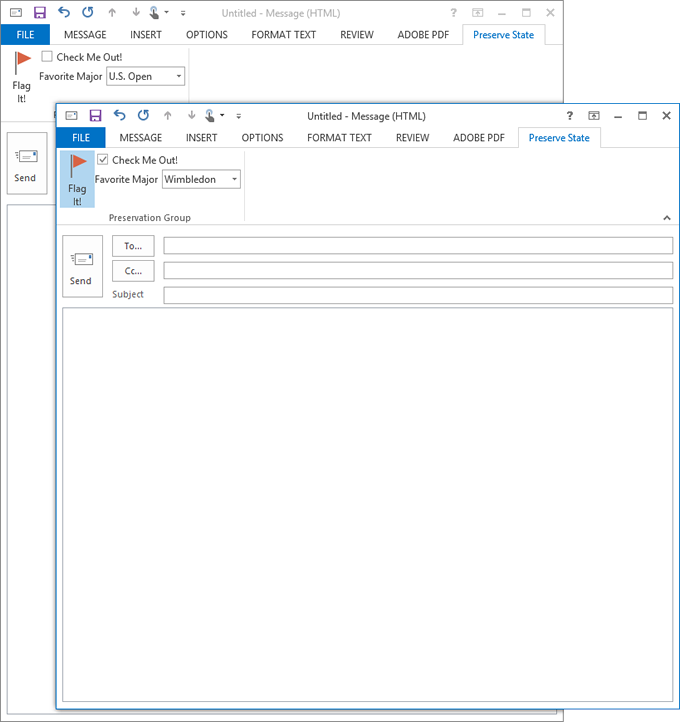 If you decide to build an Outlook add-in, you’re going to want to customize the user interface. If you start customizing the Outlook user interface, you’ll probably build a custom ribbon. If you build a custom Outlook ribbon, you’ll want to put some controls on it like a button that toggles, a checkbox, and a drop down control. If you add these types of controls and finish writing your code, you’ll want to test your add-in. If you hit F5, start Outlook, and test your addin, you’ll be tempted to open multiple inspector windows. You will discover the problem I aim to solve today. Multiple Outlook inspectors, multiple problems? Outlook utilizes two types of windows. The primary window is the Outlook Explorer window in which the user navigates between the main parts of Outlook (e.g. mail, contacts, calendar, etc.). Typically, you only have one Outlook explorer window open, although you can open multiple. The secondary window is the Outlook Inspector window. This is the window that displays individual Outlook items (e.g. mail, contacts, calendar, etc.). It is quite common to have multiple inspector windows open at any given time. And this is the source of our problem. Custom Ribbons do not preserve their state across multiple inspector windows by default. You have to code this functionality. This is our problem. How do we make it happen? I’m so glad you asked! 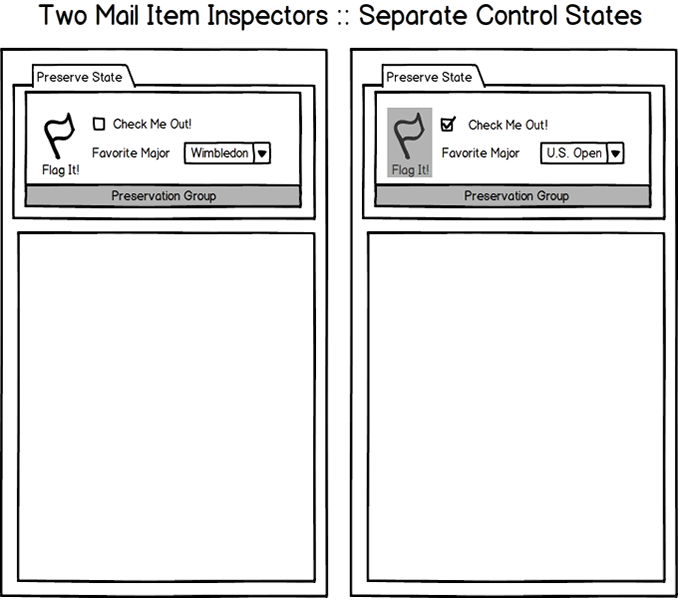 Boiled down to its essence, the strategy is to create a custom user property and store its value in the Outlook item displayed in the inspector window. If you have multiple controls you want to maintain, you add additional user properties (see Figure 2). When the user takes an action that changes the control’s state, you update the control’s corresponding user property. When the user switches between Outlook inspector windows, you set the control state by reading the corresponding user properties and updating the ribbon controls. This plugin for Outlook 2013, 2010 and 2007 includes a single custom ribbon with three controls: a button, a checkbox, and a drop down. In terms of code, there are a handful of methods (custom methods and control events). We are going to use Add-in Express for Office and .net. With Visual Studio open (I’m using Visual Studio 2012), create a new project according to these steps. Create a new ADX COM Add-in project. Move through the New Microsoft Office COM Add-in wizard dialog and select VB.NET as in this example, or C#, or C++, as the language of choice and Microsoft Office as the target application. The minimum supported version needs to be Office 2007 or higher. After you have the project open in Visual Studio, add an ADXRibbonTab control to the AddinModule‘s in design surface. Change its Caption property to Preserve State. Add a ribbon button group (AdxRibbonButtonGroup control) to ribbon tab and set its caption to Preservation Group. Add a check box (AdxRibbonCheckBox control) to the button group and set its caption to Check Me Out. Add a drop-down control (AdxRibbonDropdown)to the group. Its caption needs to be Favorite Major. Add five items to the items collection and set their captions to: (None), Australian Open, French Open, Wimbledon, and U.S. Open respectively. Set the drop-down’s SelectedItemIndex property to 0. Hopefully, your Outlook ribbon is similar to Figure 3. Before we write some code, you need to add Outlook events to the AddinModule. Right click on the AddInModule design surface and click Add Events. In the Add Application Events dialog box select Microsoft Outlook Events and click OK. This action adds an adxOutlookEvents control to the AddInModule and make Outlook events available in the AddinModule class. Calls the GetStateProperty function (explained further below) and stores it in a variable. Sets the default state of the control. If a value was returned by GetStateProperty, it sets the value of the control’s relevant state property (i.e. Pressed or SelectedItemIndex). This is how the magic happens but there is a supporting cast of methods. The SetStateProperty method accepts two parameters: propName and propValue. The method then retrieves the user property and sets its value. If the user property does not exist, the method creates it. Insert the following code into the AddinModule class. The method also checks to ensure it is working with the mail item and cleans up its reference COM objects. GetStateProperty works like SetStateProperty but in reverse. This function accepts a context object and a propName string as parameters. The context is the inspector window while the propName is the user property whose values we want to retrieve. Insert the following code into the AddinModule class. The ribbon button’s click event calls the SetStateProperty method. It specifies “FlagIt” as the propName and passes the button’s pressed state as a string value. The ribbon check box’s click event calls the SetStateProperty method. It specifies “CheckIt” as the propName and passes the check box’s pressed state as a string value. The ribbon drop down’s OnAction event also calls the SetStateProperty method. It specifies “Favorite” as the propName and passes the drop down control’s selectedIndex value as a string. If they don’t, you can complain to the author in the comments section. If you complain to the author, he’ll probably become bothered. If he becomes bothered, he’ll spend all day wondering why it didn’t work. If he spends all day wondering why it didn’t work, he’ll find a fix. Awesome, makes much more sense than my unfinished article from a few years ago! How did you do this without using Invalidate and Property Changing?? Mind = blown! Thanks Eric. I started down the path of using Property Changing but it wasn’t 100% reliable. With some help from Dmitry, I moved to using the click (or onChange events). I have used OnAction event for handle the button click and it is working also. But when I have used Key press like (Alt + H + X), the action of cut are also triggered. I think it is impossible to distinguish between these events because both of them (clicking on the Cut ribbon button and pressing the keyboard combination) lead to the same action – calling Excel’s Cut functionality. Very nice solution ! I agree with Ty, PropertyChanging is not reliable. Only problem with this method is, if the user simply opens the inspector, and then try to close it, he would get the “Do you want to save your changes?” message, as we have change the userProperties (but he hasn’t !). Do you know a way to avoid this ? The way to prevent this message box is to save the mail item after updating its custom properties. I tested this change on my system and it resolved the issue. Thanks for your reply Ty. I haven’t tested your solution yet, because I expect it to raise a Write event. I feel like this would be even worse, especially for meetingItems. Do you confirm it does that ? If so, would you have another solution ? You are correct. It will raise the Write event. This might do the trick. I have not tested with AppointmentItems. I assume you want to suppress Outlook’s prompting to send updates to other meeting attendees? Hi Ty, This is a great article! But I have the same problem as mentioned in the comments by Romain. I do not wish to call Save in the SetProperty call because that goes and creates a draft for this item. The nature of my product is that we do not allow user saving data when a flag is On. How can I preserve the ribbon state without calling Save. I’m sorry for the delay but Dmitry and I took some time to discuss it. The best way to do this is according to the strategy I explained. If you avoiding a draft email is a must, then you could try tracking the Inspector window’s HWND property. The AddInModule actually has a method for this (GetOutlookWindowHandle). If you combine this tracking with a KeyValuePair collection to track the ribbon controls and their state, you can make it work. We have not tested either of this ideas they can work. That said, the easier option is to call Save. The draft will delete after sending. You can also peform periodic checks of the drafts folder and delete them if required. I just stumbled upon this again, and after implementing a similar solution that relies on PropertyChanging events I’m now more than a little concerned that it’s not “100% reliable”. In what way exactly? I’ve found it much more reliable than setting the Ribbon controls directly, which appears to be very unreliable in that the state doesn’t always update – even with Inspector.Activate events. I instead use Wrapper classes and set control state values in class properties, and read those properties during the PropertyChanging event. When I change the control state I do NOT set the control property – just the relevant class property – and call Invalidate() and let the PropertyChanging event retrieve the class property value into e.Value. What I also meant to say is there are definitely pros and cons to each approach. Ty’s way is more simple by far and very elegant, and should handle the majority of situations. Using wrappers is decidedly more complex, but gives you more options for handling advanced or special scenarios (especially when ribbon updates need to happen due to changes in the message itself – Inspector.Activate only fires when switching windows). If handling PropertyChanging events aren’t 100% reliable then Ty’s way will always work. Thank you for sharing your thoughts with our readers! That page doesn’t describe another way; it contains a problem description that doesn’t relate to Add-in Express.